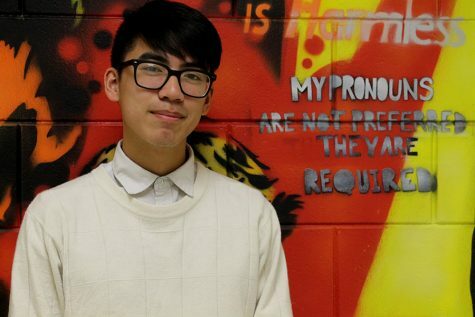 Senior B Fei, a Staff Writer on the newspaper since the beginning of this school year, can be found sporting a myriad of sweaters and wearing their signature headphones. Between exploring urban life and spending alone time in nature, Fei has a lot of interests. They are especially obsessed with fashion, specifically androgynous fashion, in attempts to blur the lines in gender expression. Fei decided to join the newspaper in their final year of high school because they believe it is important to document what is happening in our community, thus strengthening this community. Through the experience of being a staff writer, Fei hopes to gain a valuable set of skills they can use later on, of which are versatile for many different life experiences. In their free time, Fei runs a social justice blog, writes for LGBTQ+ magazines, enjoys avant garde hip hop music, eating mac and cheese, learning about lobsters, endeavouring in fashion and reading the book “Crazy Rich Asians.” Fei may want to pursue journalism in the future, but up to this point they are not sure.